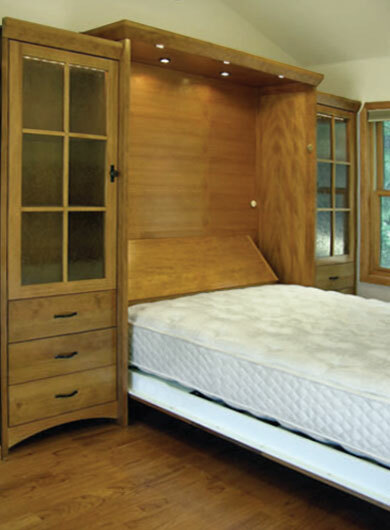 This queen size Mission Murphy bed was manufactured with a beautiful vertical-grain Fir. 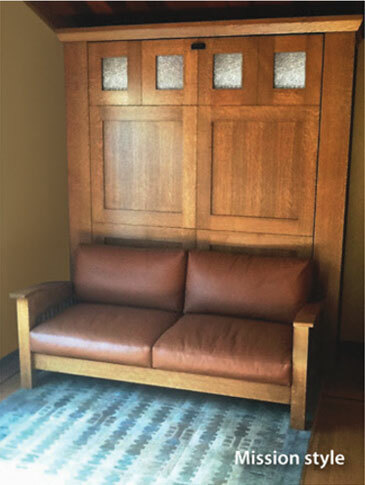 Our custom finish was created to match the existing woodwork in the room. 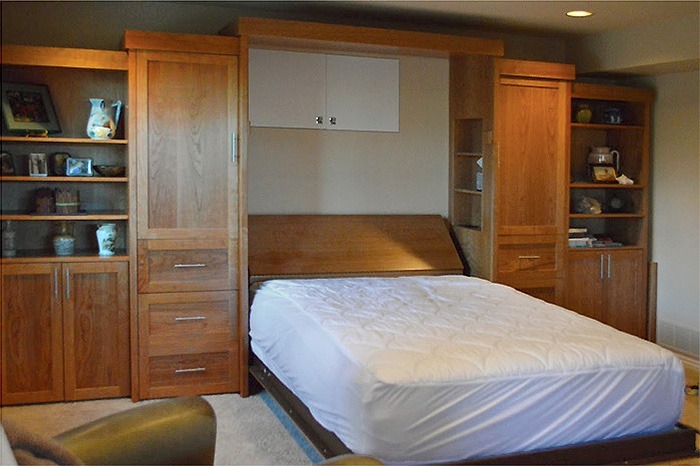 This is the first Mission style Murphy bed system we did with seeded glass – and it looks marvelous! There are lights inside the side display cabinets, and notice the custom lights in the bed storage area. 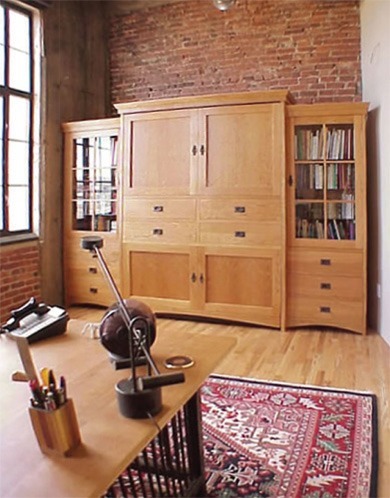 This basement home office features a natural cherry finish. We intentionally left our interior back panel off this unit to allow access to the crawl space hidden behind the lowered bed. 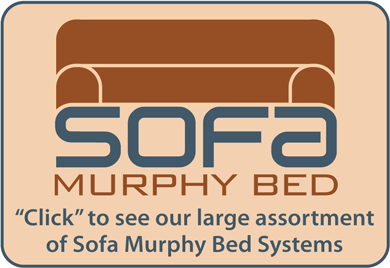 This Ultra Luxury 14″ thick memory foam mattress accommodates a sloped Cherry headboard, which will also easily contain the pillows when the bed is in its stored position. 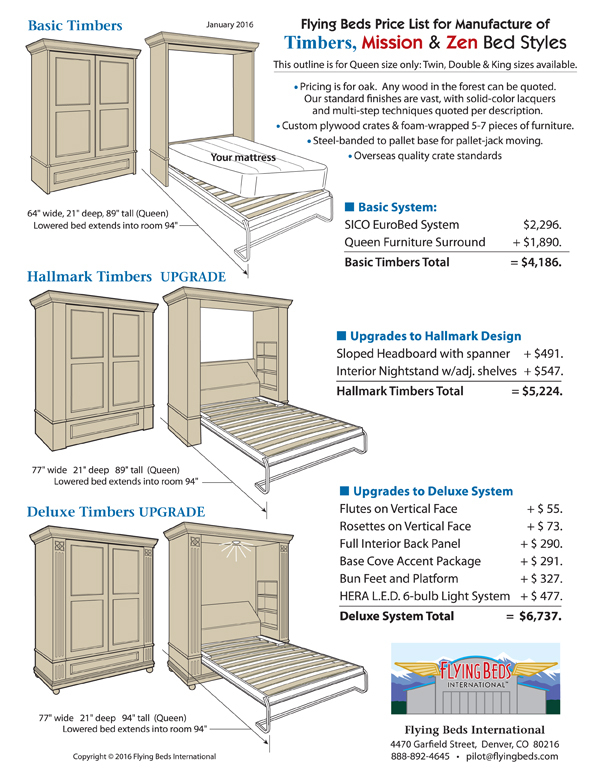 The closets on both sides of the bed allow for 6″ recessed shelves, which also feature our famous “hidden night stand”. The bottom shelves have electric and USB receptacles. 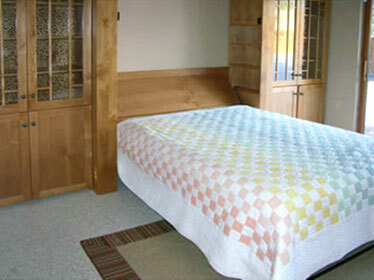 Once the bed is closed, the sloped headboard disappears. The famous Hungarian Flour Mill Lofts in downtown Denver are behind Coors Field. Rather than being one of those new construction places, this is a true-to-gawd loft! If you look out the windows, you’ll see the Highlands Italian neighborhood where the stone masons lived, way back when Denver was a young city supporting the mining of gold and silver in the Colorado Rockies. For all you historians out there, the Hungarian Flour Mill is where they milled the wheat locally, which made it more efficient to bake bread in Colorado’s high altitude. 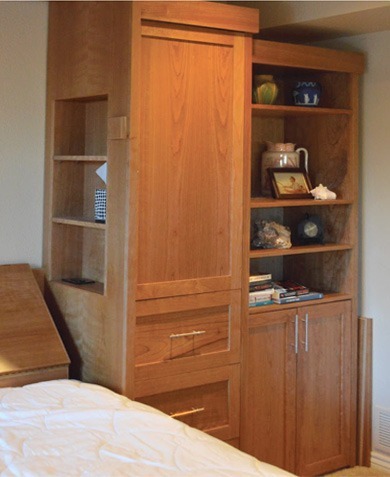 This double-size Mission style Murphy bed was created using Cherry wood. It fits the office perfectly! 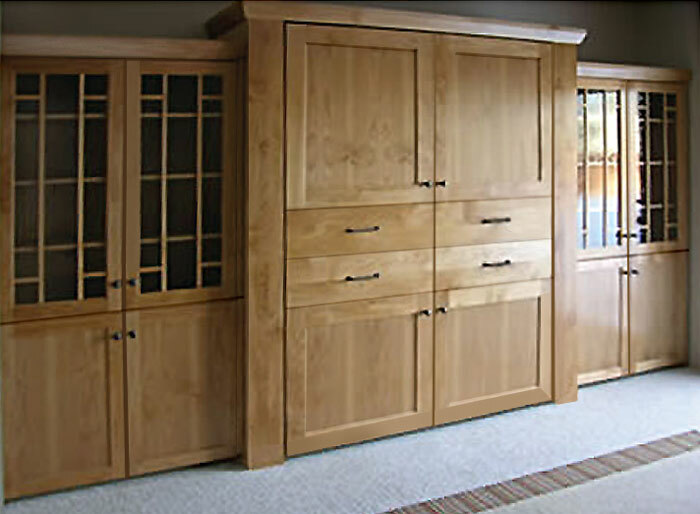 We’ll design and manufacture your unit to exactly accommodate the space you have available. This particular model is 101″ wide, x 21″ deep, x 88″ tall. 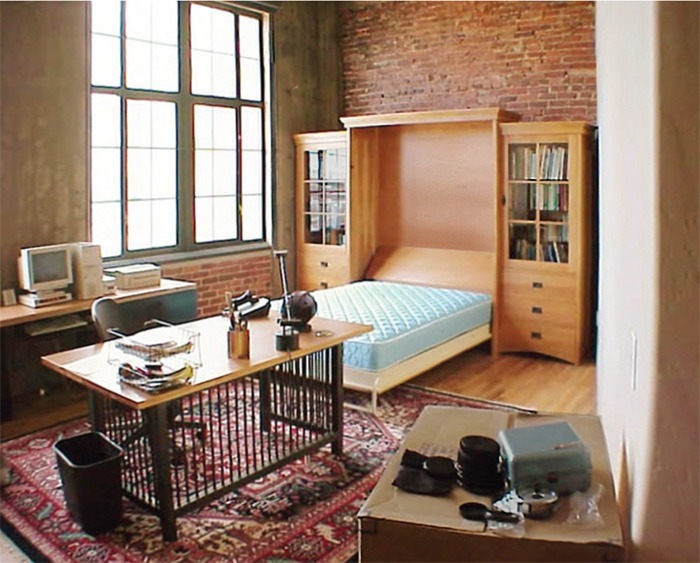 This combination Mission Sofa and queen Mission Murphy bed found a home in beautiful San Francisco. It was custom made to fit the width of a narrow wall. 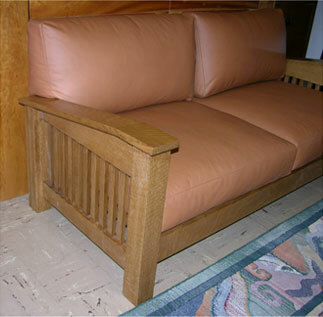 The Mission theme shown here carried over to a leather sofa with this Morris Chair arm design. 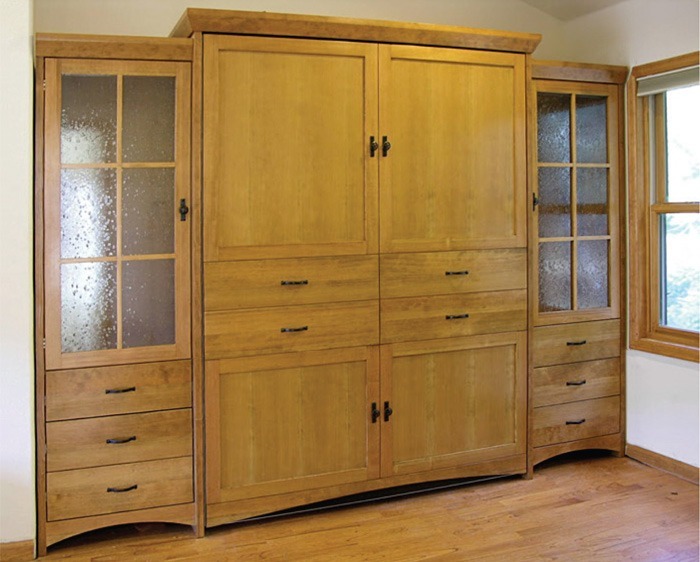 The whole system was created using exquisite quarter-sawn White Oak. 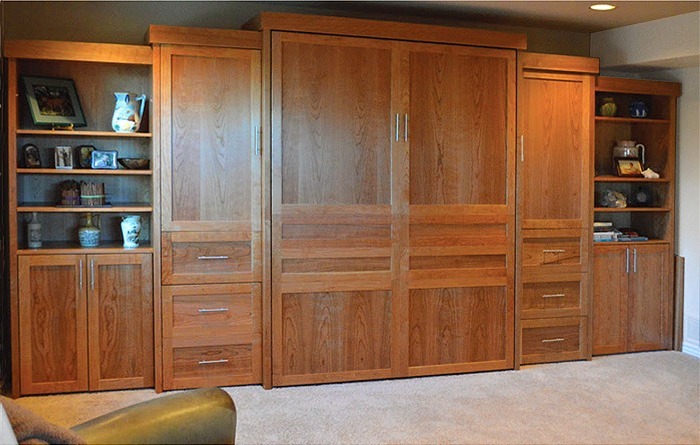 The Tucker family in Arvada, Colorado designed this Mission style Murphy bed in select Alder with a natural finish. Mr. Tucker asked FlyingBeds to create a unique door design using his own design concept. In addition, he requested a rustic looking “seeded” type of glass, which has tiny air pockets inside that create a textured appearance, mimicking the look of hand-blown glass.